Only 20 minutes from the McLaren Vale wine region our three luxury suites encapsulate luxury, tranquillity and spectacular sea views. Located along the Fleurieu Coast and in one of the great wine capitals of the world, the suites feature either king, ensuite bathrooms, lounge, and dining, plus your own private deck. The lodge also includes a fire-pit with views across the valley & coast. Perfect for couples, our autumn special provides a complimentary 1 hour massage with any direct booking. What makes a romantic escape? Is it the ease of your own private country retreat, a fully stocked wine fridge, or the 100 wineries on your doorstep? At Coast & Co., your rural getaway doesn’t have to scrimp on luxury. Our coastal apartment has been designed with the utmost love and care to provide a serene escape nestled in the southern Australian countryside. A stroll along Carrickalinga beach – only a 5-minute drive and voted SA’s finest by Lonely Planet – offers opportunities to witness stunning coast and nature. Catch glimpses of seals, dolphins, kangaroos, wallabies, koalas – the Fleurieu Peninsula is a haven of biodiversity and the perfect opportunity to connect with nature and your partner! Escape to complete luxury and relax in the knowledge that no detail, however small, has been overlooked. During your sumptuous stay at Coast & Co.’s tranquil coastal apartment, expect nothing but the best from a delicious continental spread, unlimited access to your own coffee pod machine, spacious rooms decorated to the highest standard, and luxury extras to make your home away from home exceptional! After a day of sampling world-renowned wines and fresh local produce, take a soak in our traditional English bath, enjoy a bottle of complimentary wine on your private deck, or simply enjoy the silence of this remote retreat. The views from your apartment are nothing short of magnificent, stretching past green valleys and grazing animals as far as the coast. Coast & Co.’s premium accommodation is located in the ideal location to escape from the stress and noise of everyday life and to connect with your loved one. Enjoy the original guest house that the owners built for themselves. Ideal for a couple that wants the extra space to stretch out and stay a little longer. With a fully equipped kitchen that boasts two ovens and all the mod cons, two private decks, private BBQ area, and stunning ocean views, the guest house is extra spacious and dressed to impress. Only a 5-minute drive from Carrickalinga Beach, voted South Australia’s finest by Lonely Planet, and 25 minutes drive from world-class wineries, the guesthouse is the ultimate food, wine, and coastal retreat. A 5 star experience! The perfect place to retreat and get away! Hosts are super friendly and attentive, makes for the perfect trip. Breathtaking views. Amazing host. Great place for couples, families and friends to plan vacations/ weekends. Thank you Laura and Simon. We will be back. Soon. And again. Simon’s Place was a quiet little comfortable retreat, with amazing views, in a fantastic location with plenty to explore within the local area. Simon’s communication was second to none and his tips for eating out within the local region were on point. I would certainly recommend Simon’s place to other couples looking for a break away from the rat race. We had a lovely and relaxing weekend. It was a stylish & well equipped space with everything we could have needed for an amazing winter weekend away. The views were stunning and the fireplace made it so cozy. Such a beautifully presented apartment, lovely little details to make the stay very comfortable. A perfect winters weekend away with the wood fire, amazing views across the hills, wine & yummy local goodies to eat. Simon is a great host. Place was so lovely. Perfect for an escape from life for a few days to unwind. Close enough to go into town if wanted but by bringing own food meant a real escape as kitchen facilities fantastic. Amazing views too add to it all. 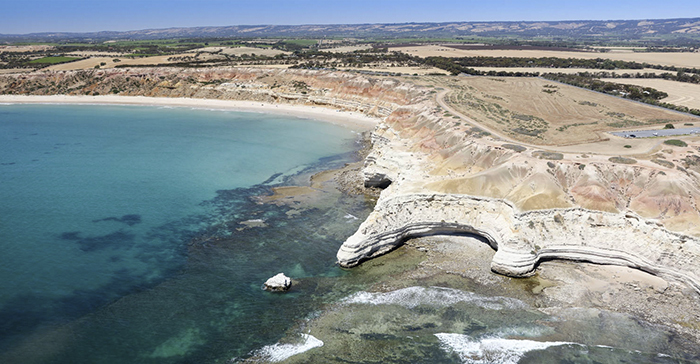 Looking to Explore the Fleurieu Peninsula? With rolling valleys, sandy beaches, sun-soaked vineyards, and plenty of wildlife, the Fleurieu Peninsula showcases the best of Australia’s diverse offerings. While you’re unwinding in our romantic coastal accommodation, why not explore the gems the region has to offer? Whether you’re a foodie, wine lover, or nature enthusiast, the Fleurieu Peninsula has something for everyone. Our range of day tours, e-bike hire, and multi-regional tours take you on a cultural and scenic exploration.